Declan Shalvey once said that he was shocked when Warren Ellis asked him to draw one of his independent books. I replied that I found it unsurprising especially considering how much of a masterpiece Moon Knight became. In any case both he and I were very enthusiastic about the new work called Injection. This comic brings us the second of the Ellis writing styles, in which the mystery slowly unfolds and various characters merge into an intricately woven plot. It is not the esoteric fantasy that Moon Knight inhabited but more a wonderfully cohesive set of personal stories that are just itching to come together. With Jordie Bellaire joining Declan on colours, there is plenty to be excited about. This particular issue tells the tale of three people who are seemingly related but there is no specific rapport establishment at present. We have the older physically impaired aggressive redhead who has just exited a fantastical realm and uncovered some form of dangerous secret. Then there is the pretentious Indian chap sitting in a ridiculous chair overlooking Manhattan, expressing deep-seated paranoia with an inferiority complex whilst deliberating the sandwich styles of the day. 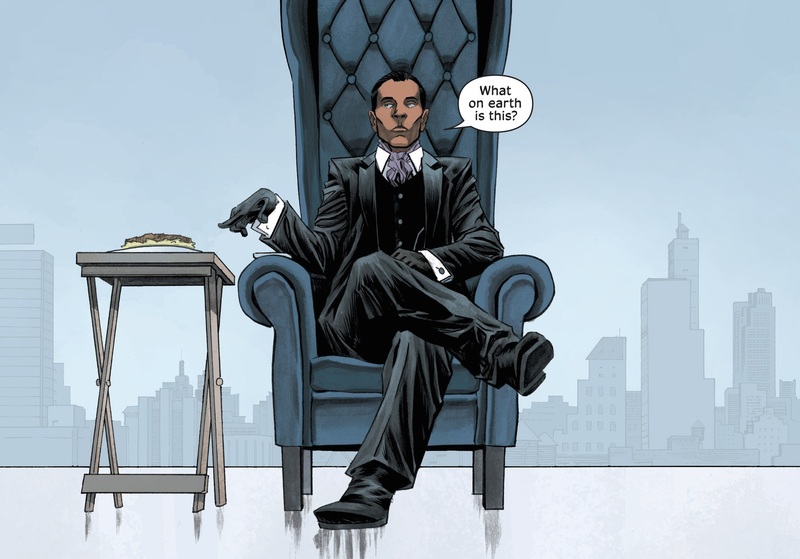 Finally we have the cool black guy who looks dapper in a smart three-piece suit and is the cliché covert spy with supreme planning and very chic gadgets. Each one of these story chapters play on classic character tropes but they all have subtle nuances that make them feel quite fresh. 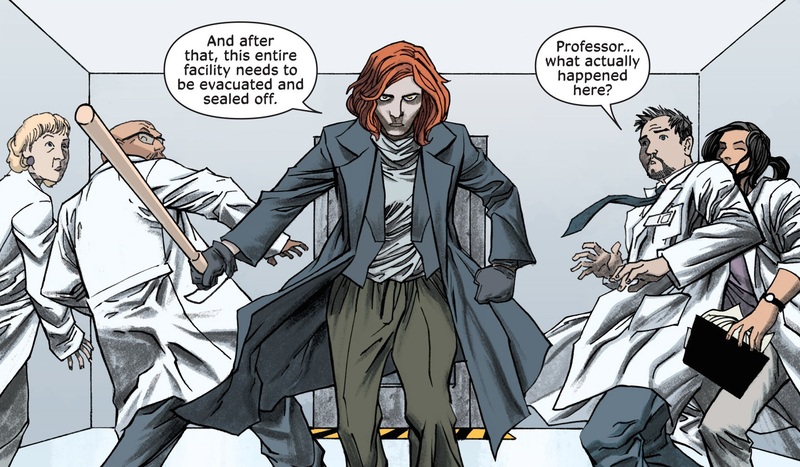 I particularly like the description of the strategist, as a person that is fighting before the opponent knows there is a war on, or the idiosyncrasies of the tall redhead as she flails her walking stick, requesting a sandwich. These characteristics are the basis for Shalvey and Bellaire to build their story and are personally where I think they both shine. The pages are focused on the action and the protagonist with little cluttering in the background. It keeps the art clean and precise but also affords time for quite beautiful texturing of features and expressions. The lady of the group has quite sunken eyes and a scrawny face brought about more so by the colouring, in contrast to the beautiful contoured face of Viv as he sits upon his upholstered throne. As one person flagellates, the other perches and the final one is flung into a chandelier. Declan is given a full range of scenarios to work with and the fight scene is particularly poignant. The shattered glass and broken dishes is so painfully wincing that it builds the tension and really bears out the pain brought upon the characters. Once again the dynamism and fluidity of the fight is where the artist excels, as the sequence of events is so simple and joyous to follow. It is so fantastic to see again and don’t get me started on how well Shalvey can draw the creases and intricacies of clothing articles. Also I have never seen such a beautiful looking sandwich. So what is this book all about? Well quite simply, we have no idea. This form of writing lends to decent suspense and intrigue and Ellis is a master of this. He does not always get it right and we have waited for far too long in the past for revelations. However if you enjoy the piecemeal delights then you will be very happy, and there is no reason why you shouldn’t. 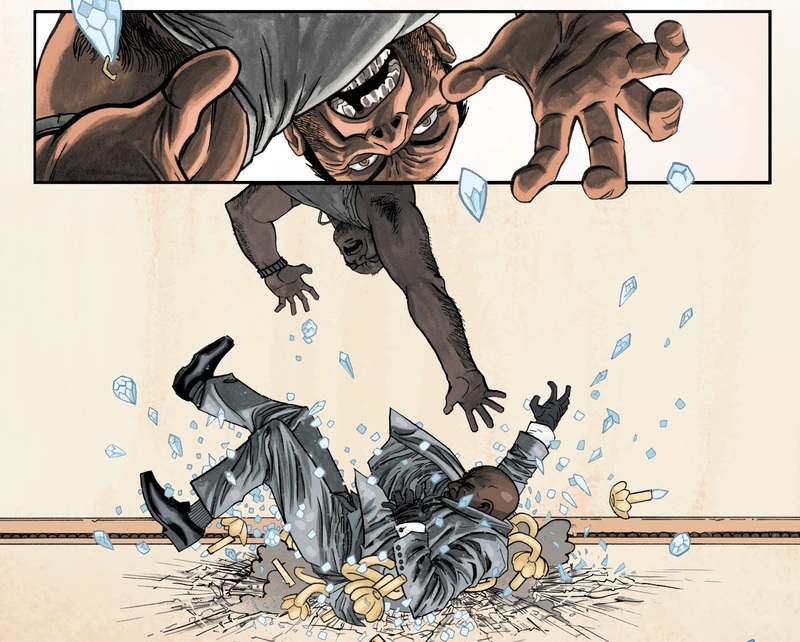 Shalvey and Bellaire have become such a wonderful partnership demonstrating a full range of abilities in being able to deliver tenacity, audacity and belligerence amongst pensive and wrought anxiety. You can certainly appreciate why Warren requested the artists that he did, because they need to grasp his sense of drama and story building. His level of intelligent and imaginative storytelling is rarely paralleled, enabling faith that the story is going to build and build big. But in the meanwhile this comic book hits so many thematic notes, albeit for just a few seconds but it is enough to make the thirst for more become so momentous. You must just calmly sit back, enjoy the ride and let it take you to heights that only Ellis, Shalvey and Bellaire can take you. Previous PostThe Theatre List 17/6 – So what does it for you?